An imperfect drawing, created during a perfectionist-busting art class. My new website/blog was born December 2012. (Wow that feels like forever ago…) I spent way-too-many-hours teaching myself how to use WordPress and putting together my new site. I had lists of ideas for blog posts, and a wonderful six month plan for moving forward from the amazing Shauntelle Hamlett. I really was excited to get started! I had a vision! I had passion! Let’s do this thing! I don’t know about you but when I’m nervous, I’m not hungry! Logically, being nervous about posting made little sense. I mean, after all, it’s not as if I’m not writing every day on other platforms. I’ve written who-knows-how-many blog posts and articles at About.com Fertility. I’ve written three books, my latest, Birth Plans for Dummies, just last year. I’m writing all the darn time, usually always for audiences much bigger than my own personal website. So what gives? I thought back to when I was taking private drawing classes with a lovely artist here in Israel. I’d come to class, excited about the idea of drawing something new. I could see in my head exactly what my next piece would be. (Whatever it would be, it would be perfect. Obviously.) I carried my briefcase full of fancy, expensive paper that I had traveled an hour away to purchase, the paper with texture that just cried out, “Touch me. Run your hand across me. Draw something beautiful on me.” I had a small plastic case of charcoals and fancy chalk pastels, also carefully chosen. I’d sit down, take out all my supplies. 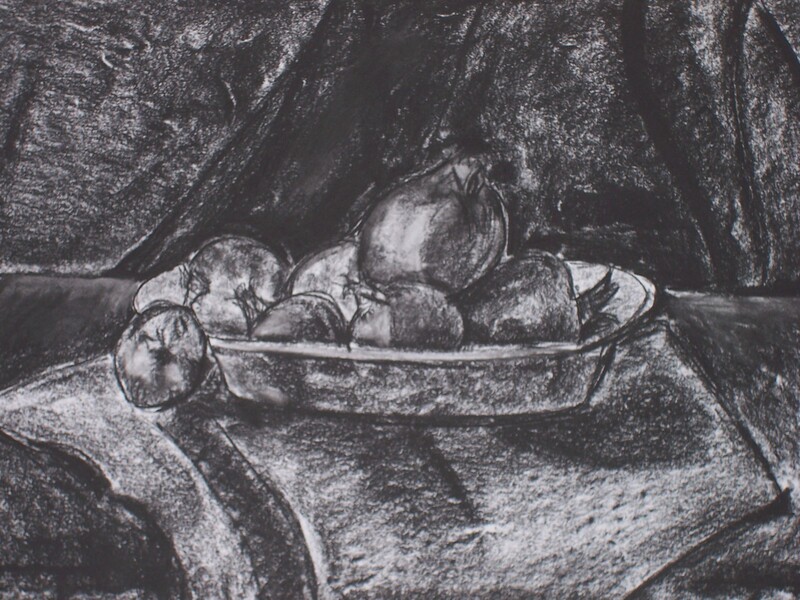 My art teacher, Rivkah, would set up something interesting to draw – fruit, or vases, or dolls and toys — different sizes and textures to work with. And then… I’d stall. I’d pick up a piece of charcoal, hold it over my paper, and then take my hand away. I’d take a drawing pencil, do a few measurements, and very, very lightly make a few guideline marks. (And then quickly forget what those marks represented.) Take the charcoal back into my hand, place it over the paper, and… freeze. I could do this for a good 15 to 20 minutes. Panic! And ruin my perfectly clean paper?! Oh my goodness, no way! Horror! As scary as this felt at the time – and as funny, as I realized how ridiculous I was being – she had the right idea. Making those first marks felt so important, like they had to be perfect because if they weren’t, the entire peice would be ruined. The class would be ruined. Forget about the fact that I was just learning and this was practice, I wanted everything to be perfect. But that desire for perfection was holding me back from creating anything. Same as it was here on my blog. I have these ideas of how I want my blog to be. I have a very clear vision of what I want to write here, how I want to use this space, what I want to share and discuss. But this perfect vision is stopping me from producing anything at all. Hence this post: a few random scribbles on this blank blog canvas. Now, just to copy-paste this into WordPress… hit publish… and…. …what do you know: the imperfect scribbles didn’t kill me after all. Can you relate? Are you shocked by these imperfect, random scribbles? (If you are, OMG, please don’t tell me. I’ll be blocked for years to come!) Please comment, I’d love to hear from you. I had that a lot and it’s weird because at the time no one was reading my blog. Yet, I wanted something wonderful to draw people in but it wasn’t until I relaxed and started writing for me that people started reading. It’s amazing when you let go how the universe just flows through you. I think the same goes for art, sometimes you just have to close your eyes and let it come. Oh, I can so relate! I started a blog last fall, but then came down with that lack of belief in myself. I’ve finally started posting to it, for real, and (what do you know?!) it hasn’t killed me yet! It is really hard. And part of my self-doubt is the idea that there are SO MANY blogs out there, who is going to notice one more? Well…*I* notice, and at this point, that seems to be all that matters. 🙂 Good job, Rachel! Thank you, Colleen!! And yes, I had a similar thought — other people are doing this, and there are SO MANY blogs out there. Who am I to start yet ANOTHER blog? This coming from someone who loves reading and finding new blogs… ! The Columbia Guide to Online Style of CGOS is the research paper style used to cite online references in fields such as science and humanity. Anxiety , which is also termed as panic attack is signified by extreme levels of fear, emotional as well as mental terror. Fear in itself is not an issue but only when it does not have any supporting causes it becomes problematic. In case of anxiety, such fears are at its extreme but without any underlying reason. Anxiety attacks can occur anytime, as there are no real associative causes. Hey Buddy!, I found this information for you: "A Few Random Scribbles, or Why Writing the First Post Feels So Difficult". Here is the website link: http://www.rachelgurevich.com/a-few-random-scribbles-or-why-writing-the-first-post-feels-so-difficult/. Thank you.